This list builds on the previous wish list. You can read the full chat in the archive. Allow suggestions and comments to be made, similar to what ICE does. This would make a good plugin and feature project first. @eric and @azaozz seem to be interested in working on something like this. 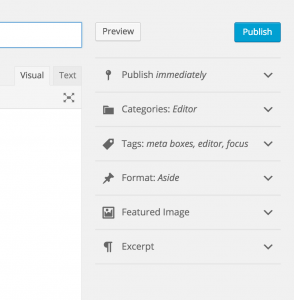 (Publish) meta box revamp. See #36474. Feedback welcome! @michael-arestad, @melchoyce, @helen, @mapk, @hugobaeta? More experimenting with inline toolbars (separate for formatting and inserting). We could first do this on small screens where the toolbar would be fixed at the top, later maybe on big screens. See also #29923. Could editor scrolling be improved (e.g. hide on scroll down)? See #36482, and also #31751. Caption placeholder. Focusing on an image would give you a placeholder for a caption. See #32175. Leaving dialog. Offer WordPress UI on leaving the page if we can with the option to save changes. See #28566. Advanced panel for the inline link toolbar, so plugins can add options. See #36312. More formatting shortcuts (code blocks, bold, italic…)? See #36433, and also #6331. Decide whether to add bold and italic shortcuts at all, how to do the triple back tick shortcut. Try to merge with TinyMCE’s own textpattern plugin. Any other things we could automatically format in the editor? Curly quotes? Thinking about wptexturize(). Save and update without a page reload. For this we will need to look into nonce refreshing. See #7756. Autosave in the browser revamp and improvements. Add some subtle, always present UI for restoring a post from in-browser autosave. Try to better detect when a restore may be needed (and show the current notice). See #36479. Handling nested shortcodes. See #30094. I’m skeptical about this one, but please do let us know what your thoughts are if this interests you. Save custom colours. See #31479. Consider the new non-editable TinyMCE plugin for our non-editable views. See #36434. Consider the TinyMCE API for inline toolbars, see #36480. Responsive images for TinyMCE. See #36475. Depends on whether we will be saving the srcset and sizes attributes in post content, @joemcgill? Handle inline image blobs in TinyMCE. Different placeholders for more and nextpage tags. See #29804. Auto embed bug. See #25387. If you would like to see more of these features implemented sooner, join us. Everybody can contribute as designer, UX expert, developer, tester, the area you feel most comfortable with. Describing your workflow, how you use the editor, and what you find difficult or easy is also a very good way to contribute. You can also leave feedback on the relevant tickets. Let us know if you have more suggestions or ideas to add to the list. The next chat will be Wednesday, 13 April, 18:00 UTC in #core-editor. Use of pre and code tags in the text editor. At the moment, you need to switch to the visual editor so anyone who has disbaled the visual editor and wrapped opening and closing PHP tags in code or pre tags, will find the code doesn’t display. Generally we use three backticks for that in Markdownland. About Curly Quotes: there is a gap between the typography rules and the keyboard layout: missing keys to set the correct quotation marks. E.g. in german a cited sentence is bordered with „…“ but there is no key for that on a german keyboard layout: So you have to use the wrong "…" instead. > It would be great if the editor corrects the quotation marks automatically based on the website language. WordPress already does that. It converts normal “…” quotes to curly quotes (i.e.. “…”), which are translatable. So these curly quotes look different in each language. In de_DE, „ and “ are used for curly double quotes, and ‚ and ‘ for single quotes. See ticket https://core.trac.wordpress.org/ticket/4539, for instance. By “inline toolbar” are you referring to support for TinyMCE inline mode (iframe-less) using contenteditable=”true” instead of an iframe, as in https://www.tinymce.com/docs/demo/inline/? That would be super useful to themes that want editor on frontend, inheriting all styles that they should be inheriting from the page. Is this inline live editing something you are planning on for default wp, similar to how the customizer lets you live-edit the theme settings? I did not mean inline mode, but that’s certainly something that could be improved as well! Our plugins could support it better. Looking forward to these changes. Would love to contribute. It came up during the meeting, so I put it in the post since it’s also a chat summary. Currently the publishing flow is still lacking some clarity. I’ve asked around and a whole lot of people still (instinctively) make the mistake of pushing “publish” when they meant to save a new copy of the draft. Especially if you have plugins enabled that auto-push posts to social media this can be a hassle. I know there’s keyboard shortcuts but that’s hardly an interface for the average user. If you’re rethinking Save, update and the general publish flow, i’d definitely like to help out!